BAMAKO , Feb 1 2013 (IPS) - Malians, including students and businesses owners, are donating money to their military’s costly war against armed Islamic groups that have occupied the north of this impoverished West African country and committed atrocities against local populations. In an apparent drive to get citizens to open their wallets, the ruling Malian military announced on Jan. 23 that over 800,000 dollars had been received from private donors. The Malian army ousted the democratically elected civilian government last March. A deal was later brokered that allowed the head of the national assembly, Dioncounda Traoré, to be appointed as Mali’s interim president until new elections could be held. 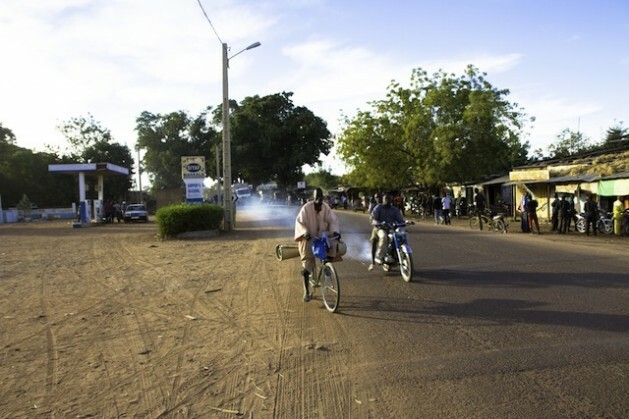 Various fundraising drives have been underway across the country since Jan. 11 when Traoré launched a public appeal for financial support following the Islamists’ capture of Konna, a town in central Mali. Since April 2012, northern Mali has been occupied by a coalition of armed groups composed of Al-Qaeda in Islamic Maghreb (AQIM), the Movement for Unity and Jihad in West Africa, and Ansar Dine, a Tuareg Islamist group. The capture of Konna, a key strategic point for the Malian forces, resulted in the French Air Force’s intervention at Traoré’s request. The air assault enabled the Malian army to halt the Islamists’ advance into the south of the country. Konna has since been liberated and is under control of the Malian army. The French-led offensive has driven out AQIM and its allies from two other key towns in northeastern Mali. “The day Konna was captured Malian school children and students were up all night,” Ibrahim Traoré, secretary general of the Mali Association for Pupils and Students, known by its French acronym as AEEM, told IPS. Some AEEM members volunteered for military service, but after several hours of discussion the leaders of the association decided to fundraise, instead. The students unanimously agreed that two dollars should be levied from the grant that each student receives from the state. A further dollar would be levied from the government’s book subsidy. To date, students have collected about 800,000 dollars, matching the amount the state received from private donors. “The money will be deposited directly into the Malian army’s account by the National University Office for Students Allocations,” Ibrahim Traoré said. The war has broken out against the backdrop of Mali’s harsh economic climate, the country is among the poorest countries in the world. In 2011, Mali ranked 175th out of 187 countries on the United Nations Development Programme Human Development Index. The economic situation worsened after the suspension of donor aid following the March 2012 coup d’état. But many say that Mali can count on the support of its people. Mali’s large diaspora have also been contributing. On Jan. 18, Habib Sylla, the president of the High Council for Malians Living Abroad, handed a 200,000-dollar cheque to the government. “This is only the start of contributions from expatriate Malians, who will respond positively to the interim president’s national appeal following the capture of Konna,” Sylla told local journalists. Similarly, businesses are also supporting the military. The Mali Textile Development Company handed in a cheque for 120,000 dollars. “The company has also agreed to make three four-wheel-drive vehicles available to the army and 3,500 workers will donate blood for war casualties,” Salif Cissokho, the president of the company, told IPS.